Network Olympus provides the means by which you can setup and adjust schedules for most kinds of tasks. This includes the launch of sensors and actions, network scans and updating of device information. Running sensors on a schedule. The task parameters can be set during the sensor setup, on the Configuration step. Running actions on a schedule. The task parameters can be set during the action setup, on the Configuration step. The task parameters can be set on the Schedule settings step in the Scanner wizard. Daily Yes The task will run every few days. Weekly Yes The task will run on selected days of the week every few weeks. The task will run on selected days of the month. The last day of the month can be selected. The task will run on selected days of selected weeks of selected months. The last week of the month can be selected. 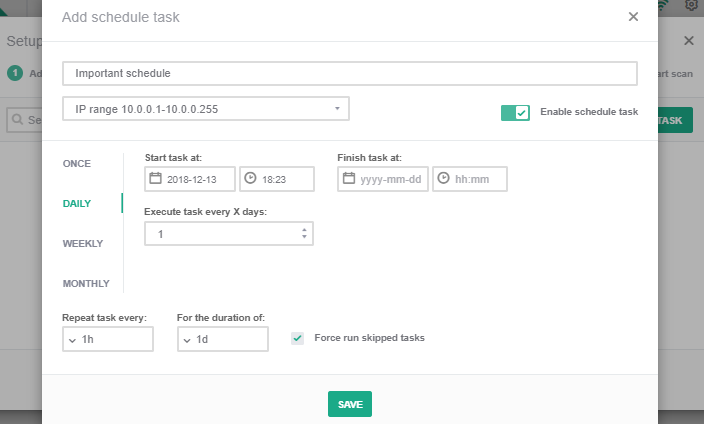 If the scheduled task is disabled, it won't be run by the scheduler until it's enabled. This setting is designed to run tasks that were skipped for some reason. In such a case, the task will be run once in the closest possible time. The date and time for the next run is then recalculated from this moment according to the schedule. After the specified date and time is reached, the period in which the task is enabled comes to an end and no further tasks will be run. If the field is empty, the task will be run until it's disabled manually or deleted. Loop for the task (Repeat task every). Allows to repeat the task at regular intervals. In this way, tasks can also be run in the interim period between the runs triggered by the main parameters. The interval can be either a few seconds for monitoring tasks, or many weeks for scanning tasks. Period for the interval (For the duration of). Allows to limit the period in which looped tasks will be performed. For example: repeat task every 1 hour for the duration of 8 hours.